Wu HuiQing, also named MuTing (穆亭), was a Hui minority member and 5th generation inheritor of Baji Quan. At the age of 13, Wu HuiQing acknowledged his remote uncle Wu Kai (吴恺) as his master and simultaneously trained Baji Quan, PiGua Quan (劈挂拳), JiuGong ChunYang sword (九宫纯阳剑), etc. Wu HuiQing was given by nature an impressive physical force and a colossus stature : he was more than 1,85 meter tall, weighted more than 100 kilograms and had incredible large hands and feet. Moreover, he had a strong a loud voice and was feared by most of his fellow people for his explosive and severe temperament. His grandson Wu LianZhi still remembers now that nobody in the Wu family would dare to smoke or drink alcohol in the family house in front of Wu HuiQing. Wu HuiQing exceeded other people in bravery, wisdom and intelligence, and he was an assiduous student, and he thus rapidly reached an extraordinary level of mastery in martial arts. Everyday, except when he was practicing ZhanZhuang (占庄, i.e. postural exercise) or DaZhuang (打庄, hitting the pile), he would carry in each hand an earthen jar weighting more than 30 kg when entering or leaving the house. After some years of this regular training his arms were as strong as iron. Wu HuiQing was also well known for his practice of “Iron palm” (铁巴掌, i.e. Tie ba zhang) that he acquired by hitting iron sand bags and other hard things. In the past, in MengCun village there was an old temple with a huge bell inside that people were usually ringing using a wooden pile. However, Wu HuiQing would every evening hit the bell with his palm, and the bell would make a droning sound that could be heard from 5 miles away. As a consequence, the fellow villagers awarded him the nickname of “Iron palm Wu HuiQing” (铁巴掌吴会清, i.e. 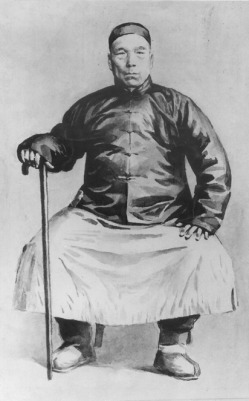 Tie ba zhang Wu HuiQing). One year, the people of MengCun were rebuilding a pavilion devoted to the celebration of KuiXing (魁星, a deity of the Chinese mythology, the god of examinations and servant of the god of literature). The pavilion was made of two floors and contained a moulded statue of KuiXing weighing 140 kg, and everybody was worried about how they could move the statue to the upper floor. When WuHuiQing heard about this, he raised the statue clamped under one of his arm, climbed to the second floor and safely put the statue on its platform, so that everybody shouted “Shenli !” (神力, i.e. “supernatural power”). Wu HuiQing’s skills were fascinating, but were never built on fallacies : every day, Wu HuiQing would go out at midnight to practice his skill. Wu HuiQing was aware that the force had to come from the whole body, and he once decided that his neck needed to be reinforced. So one day, he tied a rope to the mill of the family farm and managed to hang himself to the roof beam. However, he unexpectedly could not manage to move his arms, so he hurriedly used his feet to kick at the wall. His disciples and daughter in law who were in the principal rooms of the farm heard the noise, rushed to the rescue and brought him down. When asked if he was suffering from some sentimental problems, Wu HuiQing mumbled shamefully that his initial intention was to practice his conditioning. Wu HuiQing during all his life hated evil like an enemy and had a deep sense of justice. At that time, the Qing dynasty government had an office for inspection and control in MengCun. When people were calling out the government office, the officials would make inspections in the MengCun area, collect taxes and sentence people to penal and civil penalties, because at that time some poor people from Hui and Han nationality were selling illegally untaxed salt for their subsistence. Historically, the business of salt in ancient China was strictly reserved to government officials, and no person could sell salt for private income. Although the employees from government office were engaged in a business without competition, they were regularly swindling the villagers and practicing usury, leaving the country people choke with silent fury. When Wu HuiQing heard about this, he one night stealthily sneaked in the office and took away the clothes and other articles of daily use belonging to the chief of the government office. However the chief officer did not restrain himself, on the contrary he intensified his evil acts, offending deliberately Wu HuiQing and the fellow villagers, so that one day, under the command of Wu HuiQing, his disciples and some local people grouped together and destroyed the government office, frightening the government employees and forcing them to flee helter-skelter. After this event, the MengCun government office was declared officially closed during nearly one century. After destroying the government office, Wu HuiQing feared to be arrested and thus, he fled alone out of MengCun. After roving some time beyond the region of ShanHaiGuan (山海关), i.e. beyond the north of Hebei region, he finally arrived in the YingKou (营口) city in LiaoNing province. One day, Wu HuiQing was working as a fruiterer on the streets of YingKou, and he suddenly saw a chariot with bolted horse and mule that was running madly on the street. An old woman who was wearing a little child in her arms got frightened and dropped the child on the street. Wu HuiQing saw that the chariot what driving right in the direction of the child, so he leaped forward with a staff in his hand, stuck the staff in the chariot wheel and threw the chariot aside, saving the child. The father of this child was the director of a mining company, so he offered Wu HuiQing silver taels as a reward for saving his child, and he also arranged for him a suitable place to live in YingKou city. After Wu HuiQing had started to settle in YingKou, he used all the money the mine director had offered him to start a small business as a peddler. After some merchants from CangZhou learned about this, they started to speak about Wu HuiQing with their native place affection. In everybody’s discussion, people were saying that Wu HuiQing knew that some YingKou local bullies and loafers had build a gang to ransom and bully the non native merchants, and thus Wu HuiQing had to take care of himself. One day, Wu HuiQing was doing his business, when he saw a group of local ruffians making some trouble. When Wu HuiQing saw the situation, he rushed forward to rescue the threatened people. This time he offended a local gang called “the tigers of DongBei”, so that they settled a date and place to fight for supremacy. On the chosen date, ten head members of the gang showed up with knives and cudgels, itching to have a try with Wu HuiQing. Wu HuiQing fought them alone, with only a boatman stick in the hand and he made each of them fly in the air. After this, the name of Wu HuiQing went famous in YingKou, the merchants of the city started to praise his martial skill and his moral sense of justice. Over one hundred families of shop owners made a common agreement that each family should each month pay a silver dollar and offer it to Wu HuiQing for protecting their security. Therefore, Wu HuiQing gained friends from all circles. Later, after having saved some money, Wu WuiQing thought that many years had passed since he destroyed the government office, and that the older people from his families were already advanced in age. Moreover, he had been living alone and away from home and was getting nearly 40 years old, so he thought it would be more convenient to go back to his native place. At the time Wu HuiQing returned home, there was in MengCun town a public amusement place called TongLeHui (同乐会, i.e. a place were the villagers could watch traditional theatre or music shows) built by the five families Wu, Ding, Jin, Zhang and Yang (吴、丁、金、张、杨), and this place was going to bankrupt. When the people from TongLeHui heard that Wu HuiQing was back home, they immediately invited him to the place. When Wu HuiQing saw the desolated entrance and front yard and that more that ten people were left without anything to live from, he decided to use the remaining money he had earned in YingKou to buy the TongLeHui property. Wu HuiQing bought some additional theatre costumes and he re-run the place and the theatre troupe under the name “Yi Sheng Gong” (义盛公, i.e. “the righteous ones”), in order to offer theatrical programmes but above all martial acrobatic opera shows. The martial shows were made of real actions, beside Baji Quan bare handed two men patterns, there were also flying darts and stick fighting. Whenever the troupe played, it was warmly acclaimed by the audience. Since WuHuiQing was combining in his troupe martial arts and drama, he managed to develop the traditional heritage of his ancestors. Since the YiShengGong troupe was showing to the public real martial art skills, its reputation spread intensively and a number of famous actors joined the troupe one after another. From then on, the nearby villages started to invite frequently the troupe for shows. During the year of 1918, before the spring festival, the YiShengHui troupe received an invitation to perform in the XinDian (辛店) village. During the performance of a female actor, some local ruffians tried to steal the actor’s shoes and started to talk offensive language whilst poking the actor with bamboo sticks, so that the actor was forced to leave the stage. The yobs did not only show no remorse but they also started to throw brick fragments and shards of tiles on the stage, so that the martial actors of the troupe were forced to take out their weapons and prepare for fighting. When Wu HuiQing saw this, he feared that some people would get hurt, so he started to shout with his fierce voice, jumped down the stage and rushed toward the provocateurs. When a famous PiGua Quan expert from XinDian village, named Gao FuAn (高福安) saw the situation, he spoke to Wu HuiQing in order to persuade him from going any further and also angrily blamed the troublemakers. Right after this, the village elders made a common formal apology to Wu HuiQing, thus avoiding a raging fight. After this reasonable settlement of the affair, Wu HuiQing and Gao FuAn became intimate friends. After Wu HuQing was back to MengCun, he dedicated himself to the teaching and spreading of Baji Quan. Wu HuiQing broke the traditional concept of “teaching forms but not teaching theory” (教拳不授拳理). When he was teaching students, he took great care to explain them the theory and practical applications of BajiQuan. In December 1924, the martial manual “WuShu” written by WuYing and handed from ancestor got completely destroyed in the turmoil of the second Zhili-FengTian war. So in 1927, with the help of his fellow nephew Qiang RuiQing (强瑞清), Wu HuiQing began to write a new version of the Wu family Baji Quan manual. During 3 years, Wu HuiQing and Qiang RuiQing would ride a mule and travel to the nearby villages to collect historical data and the names of the disciples of each Baji Quan subfamily. On the 1st month of the 25th year of Chinese republic (i.e. 1936) Wu HuiQing finished to compile the manual in order to allow the later generations to keep a record of historical and cultural data. From his hand written original, 10 copies were printed by lithography and the manual was published under the name “Secrets of the Wu Family Kai Men Baji Quan” (吴氏开门八极拳秘诀之谱). Sadly enough, the original handwritten manual was stolen from the Wu family house during the Cultural Revolution, and only 3 or 4 copies of the manual have survived so far. In 1986, the manual was enhanced and re-published by Wu LianZhi.